Today is the feast of the Sacred Heart Of Our Lord Jesus Christ. And tomorrow, in one of the calendar changes that actually makes sense, is the new date for the feast of the Immaculate Heart of Our Blessed Lady. 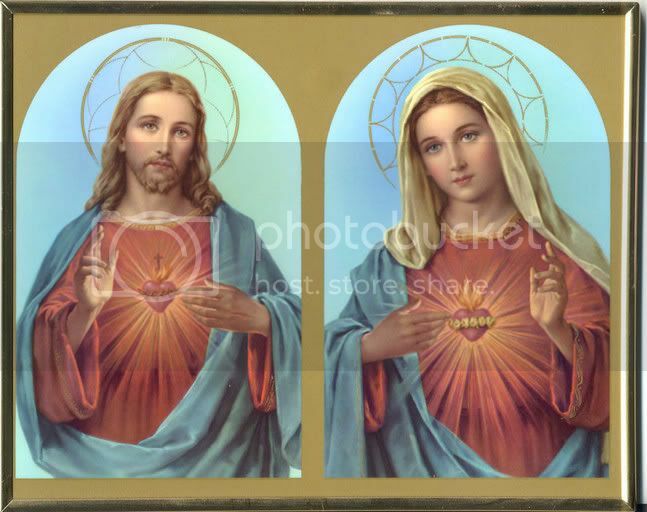 In English, we are careful to distinguish between Jesus' "Sacred" Heart, and Mary's "Immaculate" Heart. And though the devotions are closely related,and have been since the time of Saint John Eudes, we tend to think of them as seperate. But in other languages,it os common to speak of the "Sacred Hearts." And there is a growing movement,with lay groups and even what appears to be an order, honoring The Two Hearts. There is the Oblate Apostles of the Two Hearts, and the Two Hearts Alliance Apostolate. Both Hearts are holy and both are ablaze with love for not just mankind, but each of us. Images of the Sacred and Immaculate Hearts have been in my home since I was a child. But I was never taught anything about these quintessentially Catholic devotions in parochial school, Catholic prep school, or Boston College. I have felt like little Frank McCourt in Angela's Ashes. "Why is that man's heart on fire? Why doesn't this child know about the Sacred Heart? It's different in America, Ma'am. The Sacred Heart is everywhere." And no one answered little Frank's question. Indeed the Sacred Heart is everywhere. From the breasts of guillotined martyers and Vendean Catholic monarchists during the French Revolution, to those of Carlist militia fighting the Communists in Spain in the 1930s (it is the counter-revolutionary Catholic symbol par excellence), the Sacred Heart was there. In new urban American parishes in the 19th century, in the Philippines, in France especially after the Franco-Prussian War, the Sacred Heart was there. In encyclicals by three Popes, in a book by John Paul II, in the teachings of Benedict XVI, the Sacred Heart is there. It is just not in our classrooms,or parochial religious curricula, or in the homilies of our parish priests. But it should be. And it is past time to bring the Sacred Heart and the Immaculate Heart back to the forefront of Catholic life. It is for that purpose that we are offering this blog.